This is Sprinkles' strawberry frosting recipe that goes with their cupcake recipe. 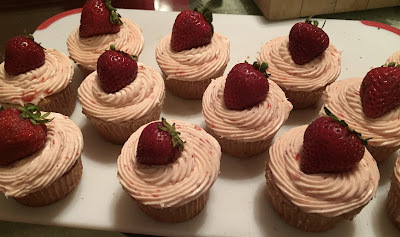 It's fabulous on strawberry cupcakes, of course, but it would also be amazing on a vanilla or lemon cake. I bet it would even be amazing on a chocolate cake. Sweet, and buttery, and pretty in pink. You should definitely add this to your repertoire!